Ingredients: Enriched Macaroni Product (Wheat Flour, Niacin, Ferrous Sulfate [Iron], Thiamin Mononitrate [Vitamin B1], Riboflavin [Vitamin B2], Folic Acid); Cheese Sauce (Whey, Cheddar Cheese (Milk, Cheese Culture, Salt, Enzymes), Milk, Whey Protein Concentrate, Canola Oil, Sodium Phosphate, Milk Protein Concentrate, Contains Less Than 2% Of Salt, Lactic Acid, Sodium Alginate, Sorbic Acid As A Preservative, Oleoresin Paprika [Color], Enzymes, Cheese Culture, Annatto Extract [Color], Milkfat, Natural Flavor). 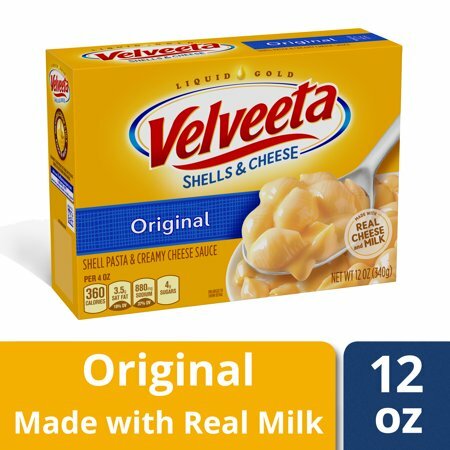 Instructions: Make Velveeta Shells & Cheese Tonight!1. Boil 1-1/2 qt. (6 cups) water in saucepan. Stir in shell pasta; cook 8 to 10 min. or until tender, stirring occasionally. Note: Do not overcook pasta.2. Drain pasta. Do not rinse. Return to pan.3. Add cheese sauce; mix well. Makes about 3 servings. Delicious as always. Easy to prepare and after I cook the shells I squeeze out the cheese in a bowl and add 1/4 cup of milk or maybe a little less depending on how soupy you like it...makes it so much better. Add shells and stir until all the cheese is melted. If you want pop it in the microwave to melt the cheese with the milk. Quick and powerful tasty meal!!! If you need a quick meal for the family, or yourself, whoop up a batch of this Shells and Cheese. Then add BBQ'd hamburgers or smoked sausages and everyone will be happy happy HAPPY!!! This is a gooey and delicious mac and cheese. It's good, but I wouldn't feed it to my little kids, just bigger kids. It is hearty and thick, but I love velvet.